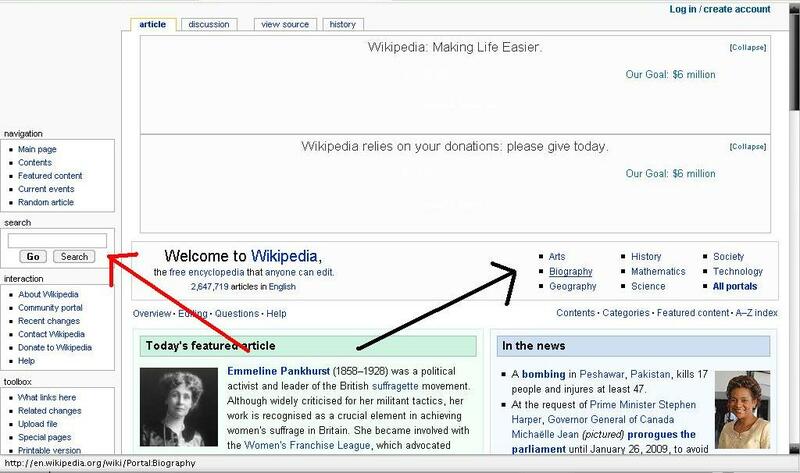 This site informs us about the basic use of Wikipedia as well as the effective uses of Wikipedia. This site also contains information about the advantages of Wikipedia encyclopedia. So, let us see what Wikipedia is and what are its uses. Wikipedia is the Web-based, free-content encyclopedia encyclopedia]project. It is a special type of encyclopedia that everyone can edit. The name "Wikipedia" is a portmanteu (a combination of portions of two words and their meanings) of the words wiki (a type of collaborative Web site) and encyclopedia. Wikipedia's articles provide links to guide the user to related pages with additional information. “Wikipedia was established as an subsidiary of Nupedia, a now-discarded project to produce a free encyclopedia. Nupedia had an complex system of peer reviewand required highly qualified contributors, but the process of writing an article was too slow. During 2000, Jimmy Wales, founder of Nupedia, and Larry Sanger, whom Wales had employed to work on the project, discussed ways of supplementing Nupedia with a more open, complementary project. Numerous sources were suggested for the idea that many contributers from the world should contribute to it and in this way the work can be speeded up and on 10th January first wiki Nupedia site was launched. There was considerable resistance on the part of Nupedia's editors and reviewers to the idea of associating Nupedia with a Web site in the wiki format, so the new project was given the name "Wikipedia" and launched on its own domain, wikipedia.com, on January 15.The Bandwidth and server were donated by Wales. Other current and past Bomis employees who have worked on the project include Tim Shell, one of the cofounders of Bomis and its current CEO, and programmer Jason Richey. The domain was eventually changed to the present wikipedia.org when the not-for-profit Wikimedia Foundation was launched as its new parent organization, prompting the use of an ".org" domain to denote its non-commercial nature. 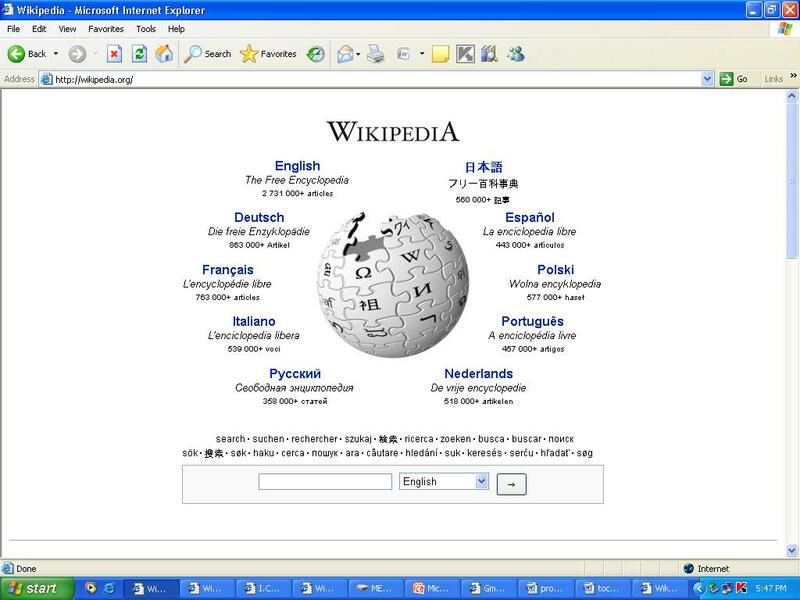 In May 2001, Wikipedia was launched in different languages such as in Spanish, Chinese, Dutch, Esperanto, French, Swedish, German, Hebrew, Japanese, Portuguese, Russian, Catalan, and Italian. These were soon joined by Arabic and Hungarian. In September, Polish was added, and further commitment to the multilingual provision of Wikipedia was made. At the end of the year, Afrikaans, Norwegian, and Serbo-Croatian versions were announced." There are two methods to search an article on Wikipedia. 1.First method is usually used when you do not know the exact title of the article, you are searching for. This can also be referred as the indirect method to search an article. This method enables you to find an article through the subject names or the fields mentioned on the right top of the screen. You just simply click on the subject relevant and then by the similar procedure find the article. This method is a bit longer but enables to explore Wikipedia more than the other method. 2.The second method is usually referred as the shortcut method to find an article on the Wikipedia encyclopedia. In this method you just simply write the title of the article you are searching for and then press the ‘search’ button to find the desired article. But this method is used only when you know the correct name and title of the article you need. And if the article title you have typed does not match with that of entitled in Wikipedia or the article is not available which is a very rare chance, the Wikipedia asks offers you to create the page with that title and also provides a list of best matches below all this. Wikipedia has advantages over traditional paper encyclopedias. Wikipedia has a very low "publishing" cost for adding or expanding entries and a low environmental impact, since it need never be printed. In addition, Wikipedia has wiki links instead of in-line explanations and it incorporates overview summaries with the extensive detail of a full article. A paper encyclopedia stays the same until the next edition, whereas writers update Wikipedia at every instant, around the clock, ensuring that it stays abreast of the most recent events and scholarship. Additionally, the editorial cycle is short. Wikipedia article are all incomplete and can be easily edited. There is a link given towards the right side of each article or above the article we can easily edit it by just pressing the edit link. Obtaining formal peer review for edits is not necessary, since review is a communal function here and everyone who reads an article and corrects it is a reviewer. Although Wikipedia is self-correcting; different articles are being improved daily. There is an organization which daily check all the edits created in Wikipedia everyday and if there is some dubious edit ,if any present are checked and removed and other edits are checked and if valid it is made part of the article and in this way the quality of the documents improves day by day. This means that it is more easily vandalized or susceptible to unchecked information, which requires removal. While if an incorrect subject is added it is corrected as soon as possible, Wikipedia is more subject to subtle viewpoint promotion than a typical reference work. However, bias that would be unchallenged in a traditional reference work is likely to be ultimately challenged or considered on Wikipedia. While Wikipedia articles generally attain a good standard after editing, it is important to note that new articles and those monitored less well may be susceptible to vandalism and insertion of false information. Wikipedia's radical openness also means that any given article may be, at any given moment, in a bad state, such as in the middle of a large edit, or a controversial rewrite. Many contributors do not yet comply fully with key policies, or may add information without citable sources. Wikipedia's open approach tremendously increases the chances that any particular factual error or misleading statement will be relatively promptly corrected. Numerous editors at any given time are monitoring recent changes and edits to articles on their watch list. Tim Berners-Lee, the inventor of the World Wide Web, repeatedly mentions in his book "Weaving the Web" that the web has grown into a medium that is much easier to read than to edit. He envisaged the web as a much more collaborative medium than it currently is, and thought that the browser should also function as an editor. Wiki-based sites are closer to his vision. In fact, the first web browser was also a web editor. Other encyclopedias might be rewritten each and every year but some updates which had occurred in very near past shall be not part of it or will be part of next version of encyclopedia which shall be released next year. So Wikipedia is effective in this aspect because it is updated each and every day although latest updates like daily news are present each and every day at Wikipedia home page in Wiki news section. Errors to Wikipedia are usually corrected within seconds, rather than within months as it would be for a paper encyclopedia. If someone sees something wrong within an article, they can simply fix it themselves. Compare that to the long, arduous and tedious process that it requires to report and fix a problem in a paper encyclopedia or other encyclopedias. Wikipedia is open content, released under the GNU Free Documentation License. Due to this it encourages people to contribute; they know it's a public project that everyone can use, that’s why everyone can share their knowledge and there research material. There are some other exciting feathers of Wikipedia like talk pages. Talk pages means that if you want some information about some article which is not mention in the respective article at Wikipedia so we can request for that article, in Wikipedia’s terminology it is called Requesting articles. Many researchers comment that Wikipedia articles are not reliable and they give their suggestions that Wikipedia is written by amateurs, but it is wrong because it is written professionals or by those people who have firsthand knowledge on the subjects the write about and if some article is edited by some person who is not much experienced at that subject it is rejected within seconds not even hours, so in short we can rely upon Wikipedia. Wikipedia has no such specific administration or organization which we can relate particularly to Wikipedia but it’s not that its total disorder. There are social pressures and community norms, but perhaps that by itself doesn't constitute bureaucracy, because anybody can go in and make any changes they feel like making. Most of the people like to do editing themselves without any charges, just for a social cause. So that’s why there is no hindrance for anyone it is open to everyone; anyone can come in and make progress on the project at any time. The project is self-policing. Editorial oversight is more or less continuous with writing, which seems, again, very efficient. But on the other hand all the internet users are not fair there are many blacks hats there. If some random administrator doesn't like you on an internet forum, you'll be gone from there fairly quickly, because they run the place so they make the rules. But on Wikipedia, everyone can edit by default. Even if you're a bad speller, or even if you're too young to legally tell us your name, or even if you have a controversial point of view, or even if you hate Wikipedia, as long as you can improve our articles you shall be welcomed to contribute. But at the there must be some check over all the research going around each and every day, Wikipedia administration can ban people who are impossibly destructive, but even then sometimes will sometimes give them a second chance. They have over 1000 administrators and on the basis of their consensus decisions are taken accordingly. Wikipedia is by far the world's largest encyclopedia. It is considered the largest and most comprehensive compilation of knowledge that anybody has seen in the history of the human race. With the English Wikipedia now having more than two million articles, it is already well over twenty times the size of what was previously seen as the world's largest encyclopedia (the largest edition of the Encyclopedia Britannica, which contains 85,000 articles). With each new article, information is becoming more accessible than it ever has before. Wikipedia's neutral point of view policy makes it an excellent place to gain a quick understanding of controversial topics. For example many issues like Kashmir issue, Palestine issue, and such issues can be taken under consideration and many people are invited to take part in it. Articles seem to be getting steadily more polished. Articles have a tendency to get gradually better and better, particularly if there is one person working on an article with reasonable regularity. There are some articles which we may say are not up to that quality but with time each and every article is getting good and better. Wikipedia seems to attract highly intelligent, articulate people belong to delinquent class. Moreover, there are some experts at work here. Over time, the huge amount of solid work done by hobbyists and dilettantes can be hugely improved upon by experts. This both makes Wikipedia a pleasant intellectual community and gives us some confidence that the quality of Wikipedia articles will, in time, if not yet, be high. As e highly intelligent people come from all over the world, Wikipedia can give the reader a genuine "world view". To use an extended metaphor, Wikipedia is very fertile soil for knowledge. As encyclopedia articles grow, they can attract gardeners who will weed and edit them, can attract educationist from different fields like doctors, engineers, professors, students’ etc .All of them can get information and can also add to Wikipedia articles to make them informative and enlightening. Wikipedia, by its very nature, resists destructive edits known as vandalism. In order to ban such activity Wikipedia has some rules which makes it resistive towards such actions for example if someone edits a page and adds some wrong information to it and it is rejected by the editor and that person again tries to do the same procedure again then at the third or fourth attempt he is totally banned. To vandalize a page extensively, you would probably need around thirty seconds, unless it involved simply blanking the page. Compare that to the five to ten seconds it takes to revert an article. Couple that with IP blocking and dedicated souls that monitor edits to the encyclopedia, and you have a solid resistance against destructive edits. The chance of encountering destructive edits that you can't immediately spot is slim. Most vandalism involves blatantly replacing parts of the page or adding immediately visible nonsense to the article - very few cases involve introducing misinformation, and even fewer misinformation and hoax edits actually slip through. Wikipedia is much better as compared to other paper encyclopedia. In paper encyclopedia the research work is not up to date, each year a new version of encyclopedia comes out with new updated articles and research material, on the other side Wikipedia’s articles are updated each and every day and it also contain more articles as compared to any encyclopedia, as more and more articles are added to it daily. As it is free online encyclopedia so everyone has easy and cheaper access to it. Paper encyclopedias are commercial. If we have internet we can easily log in to www.wikipedia.org and access to it and enter the research criteria and get the results easily. Paper encyclopedia has another drawback that it may contain some errors, Wikipedia also has errors but it is corrected by many online editors, whereas paper encyclopedia can only be corrected if it is checked and then released with another version of it, then we will have to buy that encyclopedia in order to get correct article. Wikipedia is open to large contributors, drawing a large number of editors from diverse backgrounds. This allows Wikipedia to significantly reduce regional and cultural bias, found in many other publications, and makes it very difficult for any group to censor and impose bias. A large, diverse editor base also provides access and breadth on subject matter that is otherwise inaccessible or little documented. A large number of editors contributing at any moment also mean that Wikipedia can produce excellent encyclopedic articles and resources covering newsworthy events within hours or days of their occurrence. It also means that like any publication, Wikipedia may reflect the cultural, age, socio-economic, and other biases of its contributors. There is no systematic process to make sure that "obviously important" topics are written about, so Wikipedia may contain unexpected oversights and omissions. While most articles may be altered by anyone, in practice editing will be performed by a certain demographic and may, therefore, show some bias. Some topics may not be covered well, while others may be covered in great depth. Wikipedia is written by open and transparent consensus. It has its own pros and cons. Censorship or imposing "official" points of view is extremely difficult to achieve because it is open to everyone and can easily be edit it. So it is thereby checked and changed every time through consensus. In reality, the process of reaching consensus may be long and drawn-out, with articles fluid or changeable for a long time while they find their "neutral approach" that all sides can agree on. Reaching neutrality is occasionally made harder by extreme-viewpoint contributors, so that better and better knowledge is conveyed to the users. Wikipedia operates a full editorial dispute resolution process, one that allows time for discussion and resolution in depth, but one that also permits disagreements to last for months before poor-quality or biased edits are removed. These areas, mentioned above sometimes suffer from significant omissions, and while misinformation and vandalism are usually corrected quickly, this does not always happen. For example this incident mentioned at Wikipedia site in which a person inserted a fake biography linking a prominent journalist to the Kennedy assassinations and Soviet Russia as a joke on a co-worker which went undetected for four months, saying afterwards he "didn’t know Wikipedia was used as a serious reference tool. Therefore, a common conclusion is that it is a valuable resource and provides a good reference point on its subjects. The Wikipedia community is largely self-organizing, so that anyone may build a reputation as a competent editor and become involved in any role he/she may choose, subject to peer approval. Wikipedia can be useful for those who want their research to be checked they can add there information to a relative subject if the information have some faults it is discarded or retained if true. Individuals often will choose to become involved in specialized tasks, such as reviewing articles at others' request, watching current edits for vandalism, watching newly created articles for quality control purposes, or similar roles. Editors who find that editorial administrator responsibility would benefit their ability to help the community may ask their peers in the community for agreement to undertake such roles; a structure which enforces meritocracy and communal standards of editorship and conduct. At present, around a 75–80% approval rating after enquiry is considered the requirement for such a role, a standard which tends to ensure a high level of experience, trust, and familiarity across a broad front of projects within Wikipedia. A variety of software-assisted systems and automated programs help several hundred editors to watch for problematic edits and editors. An arbitration committee sits at the top of all editorial and editor conduct disputes, and its members are elected in three regularly-rotated tranches by an established enquiry and decision-making process in which all regular editors can equally participate. In addition, specific types of article or fields often have their own specialized and comprehensive projects, assessment processes, and expert reviewers within specific subjects. Nominated articles are also frequently the subject of specific focus under projects such as the Neutrality Project or are covered under editorial drives by groups such as the Cleanup Taskforce. - Exhibits graph that displays device characteristics. - Readily available articles for electrical engineering terms and technologies. - Give extensive references for further readings on article. - Without using software like MULTISIM etc, for editing certain graphs for voltage-currents relationship we can have it simply by searching that respective article. - Beside ECA, other subjects like ICT, Calculus, Programming, Communication, etc can also be searched at this site. In project we learned how to use Wikipedia and How to use it effectively. In this project we introduced the Wikipedia and the project, the aims and objectives of the project and the ways that were adopted to achieve those objectives set to answer the title of the project. We introduced some of the effective uses of the Wikipedia and its uses for electrical engineers as well. In this project we also discovered how to use Wikipedia and how to find an article on this encyclopedia. We uncovered some of the advantages of the encyclopedia like edit ability, organization, comprehensiveness and depth, vandalism, success factors, success factors, diversity and other features. These features enabled us to authenticate the statement that Wikipedia is really one of the best encyclopedias of the world. We studied that what makes it the most visited encyclopedia of the world. We compared Wikipedia with the traditional paper encyclopedias and found why it having an edge over the paper and other commercial encyclopedias. We also tried to discover the exceptional functionality of it for the Electrical engineers particularly. We studied the article quality, strengths, weaknesses and the editorial quality review as well. We studied how to edit different articles at the Wikipedia.